1. Garfield: Puss says: "I hate Mondays." 2. Swam Lake: Because of the magical accident at the factory two swans became ballerinas. 3. Reference to E! : Medieval Entertainment. 4. Streetfighter: In the opening sequence, Fiona uses two fighting moves to take out the attacking mob: Chun Li's Whirlwind Kick (handstand and spins around) and Ryu's Dragon Punch (spins upward with fist above head). 5. Sports Illustrated: The Wolf is found reading a magazine named Pork Illustrated with the front page featuring an image of a posed pig with in a bikini. 6. An old joke: Bartender asks "Hey, why the long face?" in the general direction of the three heroes, "Donkey" looks up as if the question was directed at him, but Shrek is the one that answers. 7. Swashbuckler gag: It's been a cliché for decades now in Hollywood that - as the heroes storm the castle - the villain pours boiling oil down on them from above. 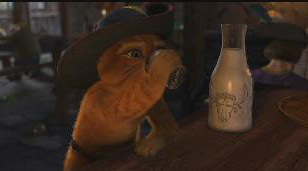 Well, in "Shrek 2," the crew at Dreamworks Animation put a Starbucks-inspired spin on that hoary old movie cliché. So - instead of using boiling oil to repel Mongo & Co. - they use steamed milk. 8. The three wise monkeys: See no evil, speak no evil, hear no evil, in this case, the Three Wise Pigs. 9. One (Is the loneliest number): Donkey sings right before Shrek & Fiona enter the house. 10. I’ve seen London, I’ve seen France: One of the three little pigs sings this as he hangs from the Fairy Godmother’s leg. 11. F.F.A.P.D. : Far Far Away Police Department, just like any other city Far Far Away has its own police department. 12. Pepper spray: Powdered pepper... not in spray though. 13. VapoRub: Donkey tells Shrek that he won’t put VapoRub on him. 14. Parcheesi: Donkey wants to play this game. 15. FFAPS: Far Far Away Postal Service; just like our UPS!